For the 30 days ended September 20th the Nevium PPC Price Index experienced a 3% decrease, declining from 79.16 to 76.56. The index has declined 46% since reaching a 12 month high of 140.6 in April 2017. Of the seven keyword groups in our study, five declined. The Other Celebrities group experienced the greatest decline with a decline from 124.5 to 105.7. The only groups that increased were Actor/Actress which increased from 110.4 to 123.9 and Products which increased from 42.8 to 46.3. Following his fight Floyd Mayweather’s PPC rate continues to rise. In March 2017 the Mayweather PPC rate was $0.13. Since then his PPC rate his increased to $1.43 just prior to his fight to $1.72 as of September 20, 2017. 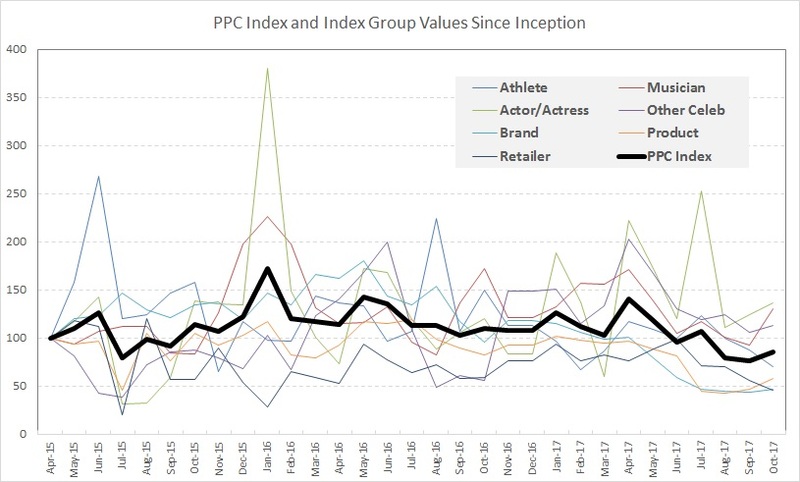 This month, the largest decline in the Index belonged to Jimmy Fallon whose PPC rate declined from $1.49 to $0.32. The largest increase belonged to Rush Limbaugh whose PPC rate increased from $2.59 to $3.94 perhaps due to the spark his comments regarding Hurricane Irma made on the internet this month. Compare to previous months, volatility within the index was quite low in September. More information on the Nevium PPC Index can be found at Nevium PPC Price Index.